How do you integrate goats? Don’t worry, knowledge of calculus is not required! 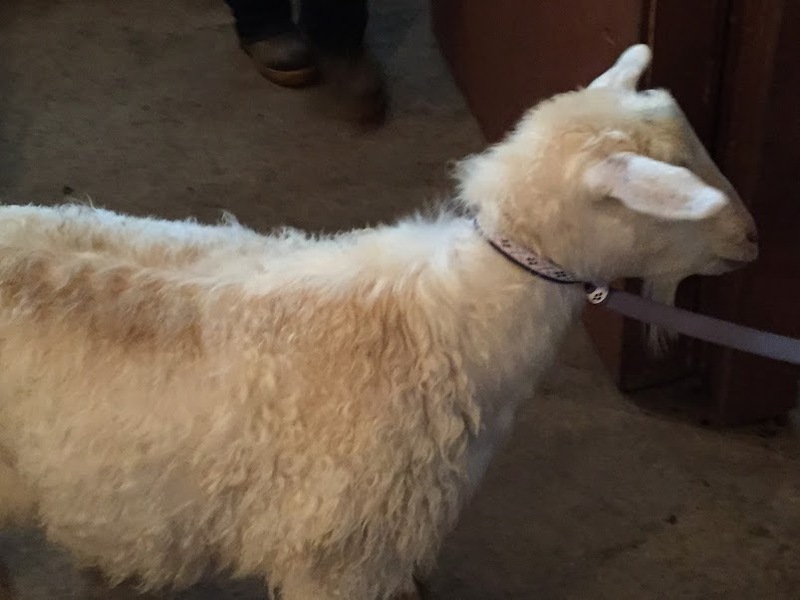 We recently adopted 2 additional goats from a great rescue / shelter in the Rochester area, Lollypop Farm. When we went to visit our potential new goats, Lollypop Farm had around 40 goats and sheep, along with various pigs, roosters, horses, donkeys, ducks, geese, rabbits, llamas, cows and emus (and of course cats and dogs). 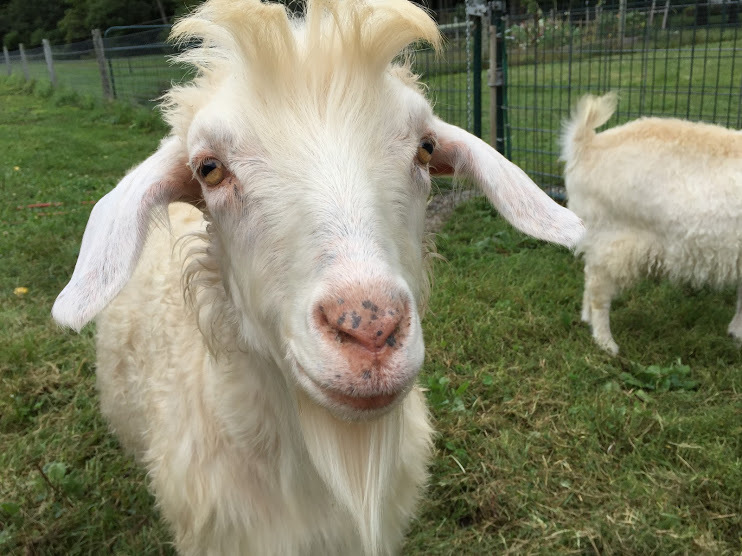 This past weekend, we adopted two additional goats from a rescue group (a separate post will follow with more details about the new goats). We needed a way to transport the goats from the rescue shelter to our farm which is a little over an hour and a half away by car. Elf on a dog leash as we led him out of the shelter. The shelter’s transport vehicle was in the shop for repairs and we don’t have an animal trailer, or even a pickup truck. So, how do you transport a goat without a truck or trailer? Even though it seems like summer is just winding down, the slight chill overnight serves as a good reminder that winter is coming. As the pastures are usually covered in snow for months at a time (last year, there was still snow on the ground until at least late April), we need to have enough hay on hand to feed the goats throughout the whole winter. And where do you store all the hay? in the hayloft, of course! 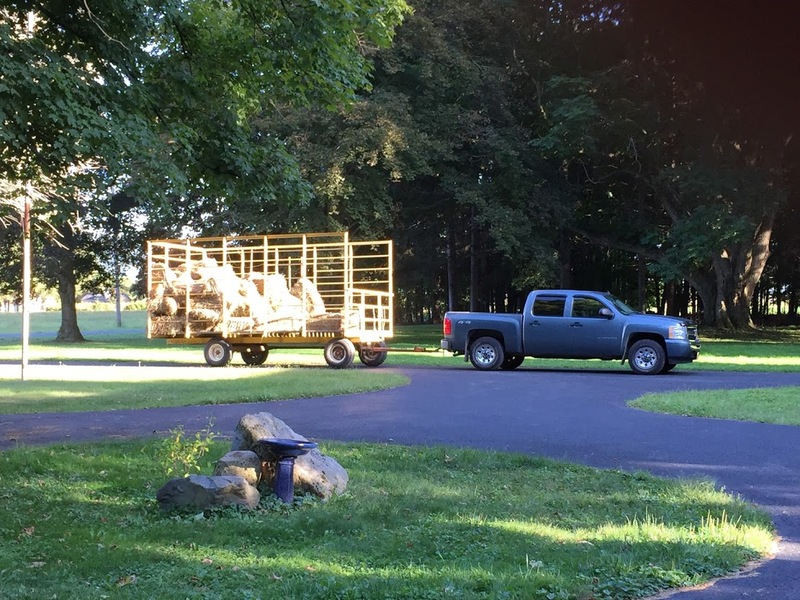 Hay wagon pulls into the driveway. Here are a few more short goat videos from the first few hours after we integrated our original 2 goats with the first 3 new goats. Here is Rascal and Rosebud scrabbling over a grain bucket (which is empty). With only 2 goats at the start, we had plenty of extra pasture land available that would quickly become overgrown and need to be regularly mowed if it wasn’t grazed. Luckily, a neighbor was looking for additional pasture space for 3 of his cows for over the summer months. We agreed to a basic pasture lease arrangement where his cows were grazing on our pastures. He also provided assistance with our goats and answered many of our farm-related questions. He came by every day to check on the cows and was an excellent resource for pasture management techniques. 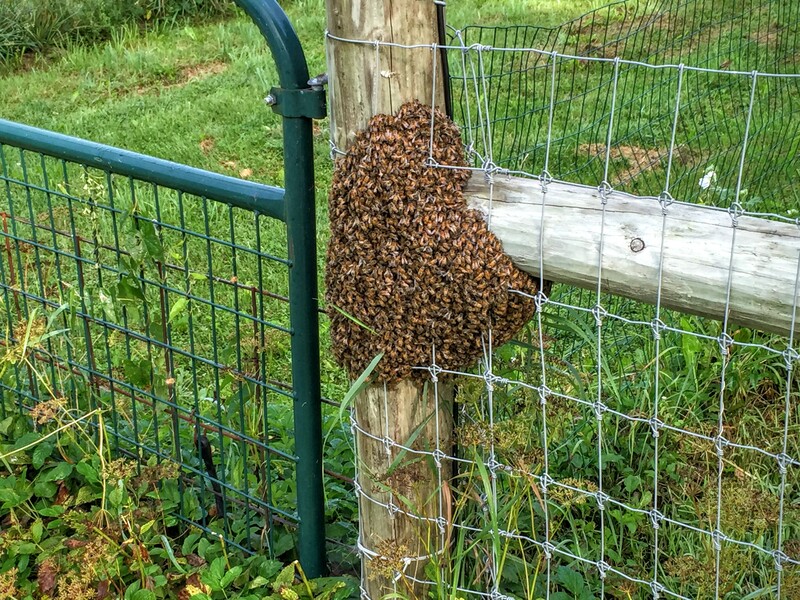 A couple of weeks ago, while walking out in the pasture, our neighbor who was checking on his cows, pointed out a strange mass on one of the fence posts. I couldn’t tell exactly what he was pointing at until I got a lot closer and could see it moving around.